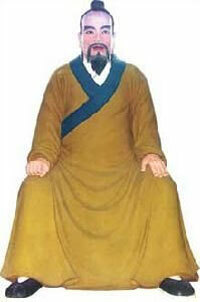 Wang Zongyue (Wang Tsung-yueh) is a legendary figure in the history of taijiquan (tai chi, t'ai chi ch'uan). Sources suggest he lived in either the 13th or 15th century. (see Wikipedia) He is often described as the principal student of the legendary Daoist monk Zhang Sanfeng from whom he learned the principles of “internal strength”  and the “Thirteen Postures,”  which he taught to members of the Chen family, where it was developed into what is modern Taijiquan. Wang Zongyue is alleged to be the author of the Taijiquan Treatise but the historical factualness of this is also unclear. For further discussion on the historical information about Wang Zongyue see pages 18-20 in Barbara Davis. The Taijiquan Classics: An Annotated Translation. North Atlantic Books, 2004. ^ For more information on “Thirteen Postures” see: Garofalo. ^ Douglas Wile. Lost T’ai-chi Classics from the Late Ching Dynasty, pp.111-114. State University of New York, 1996. William C.C. Hu. “Tai Chi Chaun: An Historical Update” in Black Belt [Magazine] April, 1975, pp. 46-50. Douglas Wile. Lost T’ai-chi Classics from the Late Ching Dynasty, pp.111-114. State University of New York, 1996.